NEW YORK - As the pitch roared off the bat, Junichi Tazawa turned to look. He stood there, staring out toward left field, where the ball was headed toward the bullpen just over the fence. He watched the ball settle, as the Yankees spilled out of their bullpen and as Alex Rodriguez followed Derek Jeter around the bases. 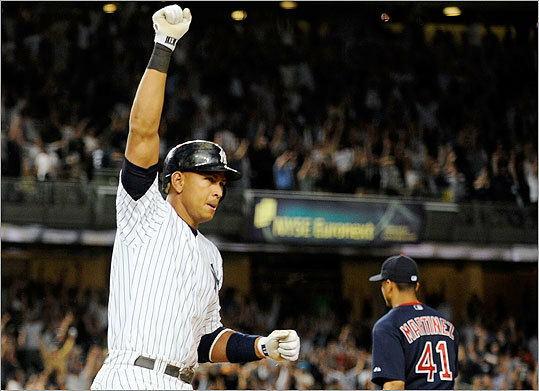 The Yankees pooled at home plate, as the hour approached 1 a.m., and celebrated a win 5 hours 33 minutes in the making. The night had deepened and the zeros had mounted and no one could do anything offensively. But with Tazawa on a major league mound for the first time, and Rodriguez at the plate, the void was simply too big. And then it happened, finally. Rodriguez smashed that pitch deep and far, way beyond left fielder Josh Reddick. Jeter crossed the plate, then Rodriguez, the first time anyone had made it home in a game that ended in the 15th inning, a game ticketed for epic status on the YES Network and bound for the recycling bin at NESN. Those two runs sent the Yankees past the Sox, 2-0, bringing Boston’s American League East deficit to 4 1/2 games. It was the fourth straight loss for the Sox, all to teams in their division, two coming in dispiriting fashion on home runs by power-hitting third basemen. Unlike the frustration Thursday night after the Sox were clobbered, the mood was slightly different in the postgame clubhouse. Chins were lifted, the attitude a touch defiant as the Sox season veers dangerously off course. “We could have just as well [have won],’’ said Jason Varitek, who went 0 for 6 and caught all 267 pitches. “We lost two extra-inning games. Our season’s not over. We’ve got two months. Obviously we haven’t played our best baseball recently. Not that today will be easier. CC Sabathia takes on the slumping Clay Buchholz with a confident Yankees club behind him. The Sox will have to refill their bullpen coffers before today’s game and somehow end the losing. “It’s a challenging time for this team, there’s no doubt about it,’’ GM Theo Epstein said before the game. “We’re not playing the type of baseball we want to play. We’re not getting consistent quality starts. We’re not hitting with runners in scoring position. It makes for a challenging time. Since the All-Star break we haven’t won as many games as we’d like. “A lot of things are going wrong with health and performance and it’s times like these that you find out what you’re all about as a club, as an organization. The Yankees almost ended it in the 14th inning, but J.D. Drew’s outstanding, game-extending catch got the Sox to the 15th. With Tazawa on the mound with one out and runners on first and second, Drew tracked down and leaping for a ball that was almost beyond his grasp, a play he didn’t even understand how he made. “It’s one of those plays where it’s kind of a do-or-die situation,’’ Drew said. “Guys on, [Eric] Hinske’s up, you make a beeline straight across the field, stick your glove up, see what happens. I don’t know how in the world it ended up in my glove. Yet, amid the turmoil of a season approaching a breaking point - when even the Sox general manager called it a challenging time - there had to be some comfort with the man on the pitching mound. Josh Beckett did his utmost to stop a Sox losing streak again, going pitch for pitch with the Yankees’ A.J. Burnett. It was a near perfect matchup, save for a half-dozen walks allowed by Burnett. But zeros dominated the gigantic center-field scoreboard, leaving the teams locked into the night. Beckett’s ERA lowered to 3.12 after seven innings of four-hit ball that included seven strikeouts. Burnett’s ERA shrank to 3.67. Still, zeros were all that mattered. They lasted until the bottom of the 15th, with Tazawa on for his second crack at the Yankees’ lineup, and his first crack at Rodriguez. He already faced Hideki Matsui, his first ever major league batter. And now, one of the best hitters in the game was at the plate. The Sox hadn’t been able to score. The Yankees did. “It was a tough night offensively for us,’’ manager Terry Francona said. “A tough night offensively for them. Just, they outlasted us.